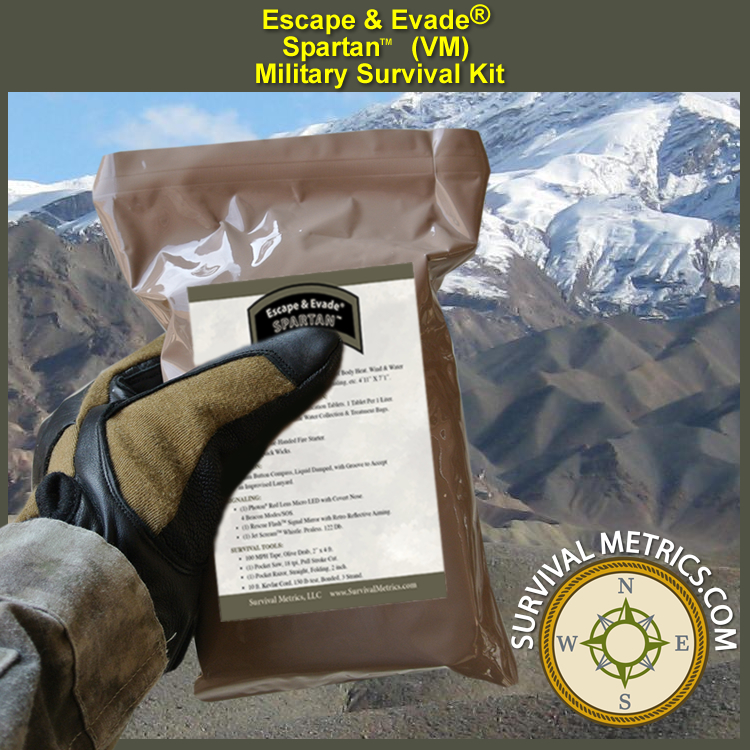 The Escape & Evade® Spartan (TM) Military Survival Kit (VM) was designed to provide the military operator with a very compact and lightweight survival solution that they could take anywhere at any time. 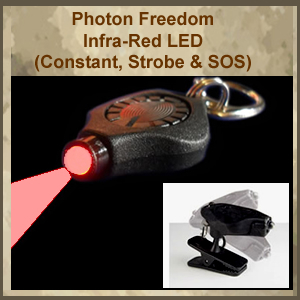 Addressing the priorities of survival, along with military-specific signaling capabilities in infra-red. 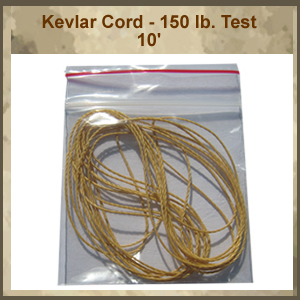 Directly comparable to the survival module listed under NSN# 6545-01-534-0935, but with sheltering / hypothermia prevention, as well as 100 MPH Tape, Kevlar cord and more. These additions make the Spartan (VM) a far superior choice. The kit is just over 11 ounces, and can fit into most modern military uniform thigh cargo pockets. The carry-pouch is the same durable Mil-Pak pouches used for MREs, but with a clear window on one side so that you can see the contents and know it is a survival kit. 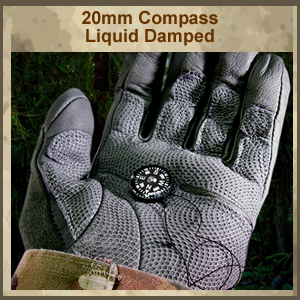 The waterproof pouch is durably heat sealed until you need it, and if you do, know that you will be prepared to continue the mission and survive. Note: This military survival kit is restricted to purchases by and for U.S. Military personnel, U.S. Government agencies, and U.S. Military contractors. All others may purchase the Escape & Evade® Spartan (TM) Tactical Survival Kit (VCM), located here. 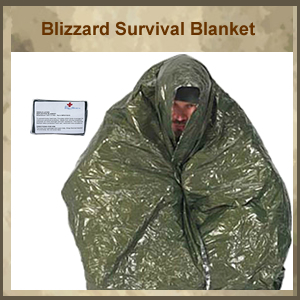 Lightweight and compact, the Blizzard Survival Blanket is your first defense against hypothermia. Silver inner for signaling and high-contrast marking for LZs, etc. Can be used for shelter construction, as a wrap to prevent hypothermia, or stuffed into existing clothing to create air pockets to retain heat. 4 ft. 11 in. by 7 ft. 1 in. Chlorine dioxide formula, EPA registered, issued to U.S. Military forces. The individual tablet pouches are stored inside a re-sealable (subdued in color) storage pouch that can be packed away anywhere. 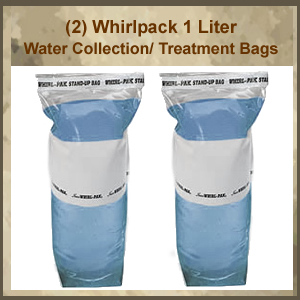 Can be used to treat collected water with water purification tablets. Two bags included for rotation pattern: treat both. Second liter ready after first one finished, fill and treat first again, etc. 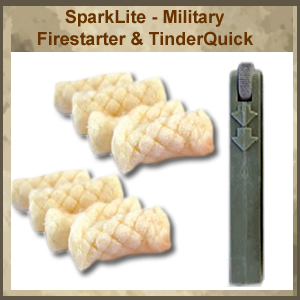 The Official Fire Starter of the U.S. Military. One handed operation in case of injury. Comes with 8 Tinder Quick Fire Tabs (1-2 min burn time each). 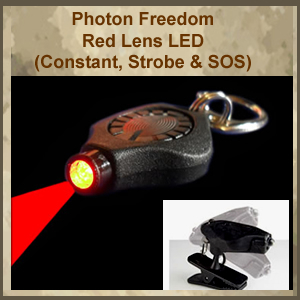 4 beacon modes: (Variable Strobes, Morse, and SOS). Can be seen over a mile away. Smart circuitry: one button controls all functions. Replaceable battery. 24K Gold plated contacts. 120 plus hour burn time at max (more if power conserved). Covert Nose to prevent side scatter illumination. Hat clip (and magnetic), and lanyard included. 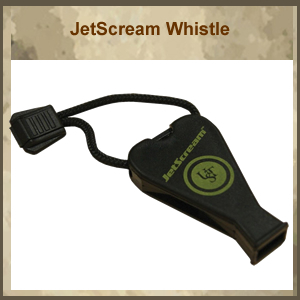 122 Db piercing shriek whistle for signaling ground rescue personnel. Pealess design works even when wet. 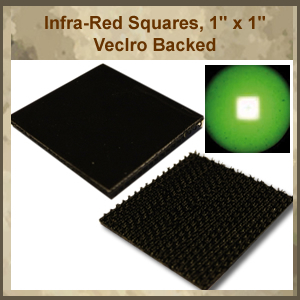 IR Squares reflect only infrared light for identification of friend or foe (IFF) during nighttime operations. Without a night vision device, squares appear black with no sunlight glare. Squares can also be sewn on the uniform sleeves and helmet cover. 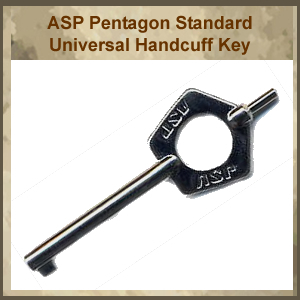 ASP Handcuff Keys are precision molded from high strength stainless steel. Each key is heat treated for strength and finished in one of five attractive coatings. A hardcoat lacquer is baked on for added protection. The unique ASP BackSet® feature allows rapid location of the handcuff keyway. Pentagon Keys are forged, heat treated and chrome plated. They are the most durable standard keys in the industry. 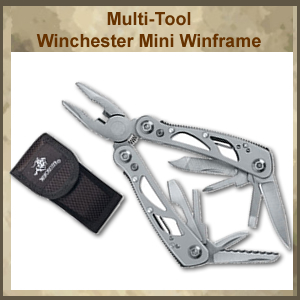 Used for drill making, snares, fishing, high strength repairs and improvisation. Woven fibers can be split and divided into three (for 30 ft). Issued to U.S. Military Forces. 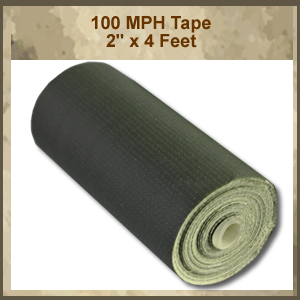 Versus regular duct tape, 100 MPH tape: (1) Better adheres to objects that vibrate, pull, or twist; (2) Better able to be taken off an object, and re-applied elsewhere; (3) Stronger than regular duct tape; (4) Adhesive more stable over time, comes off cleaner; (4) Better able to wrap on itself. Holds through sunlight, heat, cold, snow, and rain. Quantity: (1) roll, 2 in. x 4 foot. The same type of rugged, poly material used for MRE pouches, with one difference: one side is clear, so that you can view the contents and know it is a survival kit. 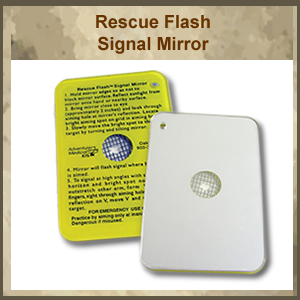 The interior of the desert tan material is reflective silver, and can be used for signaling, marking, etc. If filled with water, the clear side can be exposed to direct sunlight to aid in water purification by UV exposure (however, this is only a field expedient method. 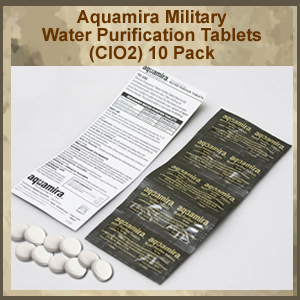 The water purification tablets in this kit are the primary water purification method). Can also be used as a small vegetation solar still to extract potable water from non-poisonous plants in regions where water is scarce.